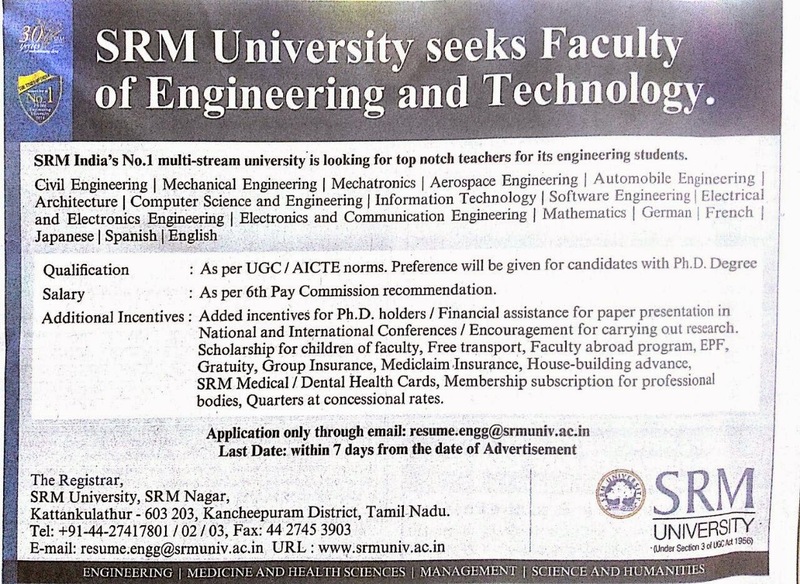 SRM University Kattankulathur Applications are invited for professors and associate professors in the following disciplines. As per 6th pay commission recommendation. Added incentives for Ph.D. holders/ Financial assistance for paper presentation in National and International conferences/ Encouragement for carrying out research. Scholarship for childrens of faculty, Free Transport, Faculty abroad program, EPF, Gratutiy, Group insurance, Medicalm Insurance, House buliding advance, SRM Medical/ Dental health cards, Membership subscription for professional bodies, quarters at concessional rates. Last Date: within 7 days from the date of advertisement. Kattankulathur -603 203, Kancheepuram District, Tmail Nadu.